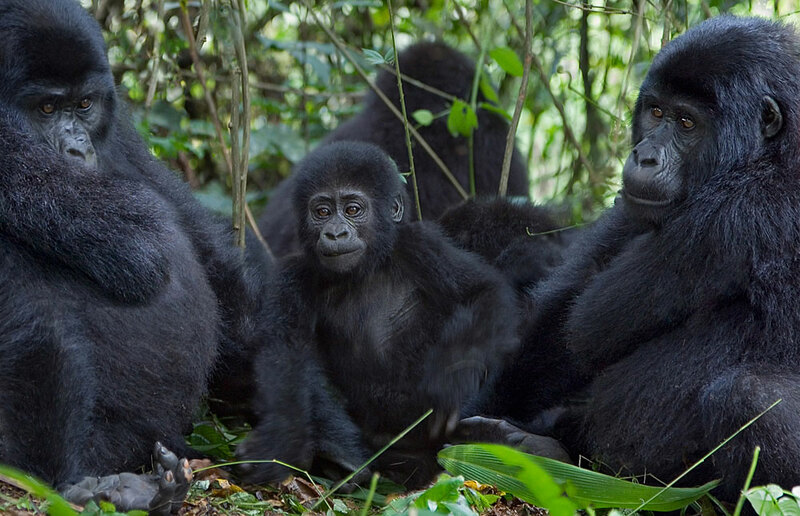 The 10 days wildlife tour in Uganda to Murchison Falls & Queen Elizabeth, chimpanzee trekking safari Kibale and Bwindi gorilla trekking safari is a wildlife, primate and adventure safari in Uganda through 4 safari parks. The 10 days tour in Uganda features Ziwa Rhino Sanctuary rhino tracking, boat cruise and game drive in both Murchison Falls National Park and Queen Elizabeth National Park, Kibale Forest National Park chimpanzee trekking, gorilla trekking at Bwindi impenetrable national park and a canoe ride at Lake Bunyonyi. You’re a mazing trip to Uganda starts with a pick up from Entebbe international airport for a transfer to Kampala-Uganda’s capital where you spend the night. From the lodge the next morning, you are driven to Murchison falls park with a stop at Ziwa Rhino Sanctuary. Arriving in the evening, the next day you take a game drive and boat cruise then transfer to Kibale forest park the next day. After chimpanzee trekking the next day, you are driven to Queen Elizabeth national park for a boat cruise and game drive the next day. You transfer to Bwindi forest park the next morning for gorilla trekking. After here, you are driven to Lake Bunyonyi for a canoe ride before return to Entebbe international airport for departure the next day with a stop at the equator line. Day 1: Arrival at Entebbe international airport then transfer by a knowledgeable Uganda tour driver guide to one of the hotels in Uganda Kampala where you rest and spend the night. Day 2: From Kampala, you are driven to Murchison Falls National Park with a tour to the Ziwa Rhino Sanctuary for rhino tracking on foot. 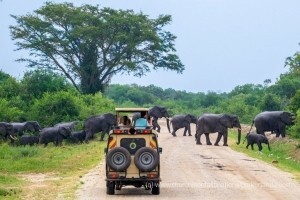 Day 3: A morning game drive after coffee starts your day and later on an evening boat cruise and hike to the top of the mighty Murchison Falls. Day 4: From Murchison falls park in the morning, you are driven to Kibale national park where you track chimpanzees the next day. Day 5: Early morning, you go for chimpanzee trekking in Kibale forest national park which is the world’s best chimp tracking location. In the evening, you are driven to Queen Elizabeth national park. Day 6: You have a scenic game drive at Queen Elizabeth national park in the morning and take a boat cruise in the evening at the Kazinga channel. Day 7: In the morning, you are driven from Queen Elizabeth park via the ishasha sector to Bwindi impenetrable national park. 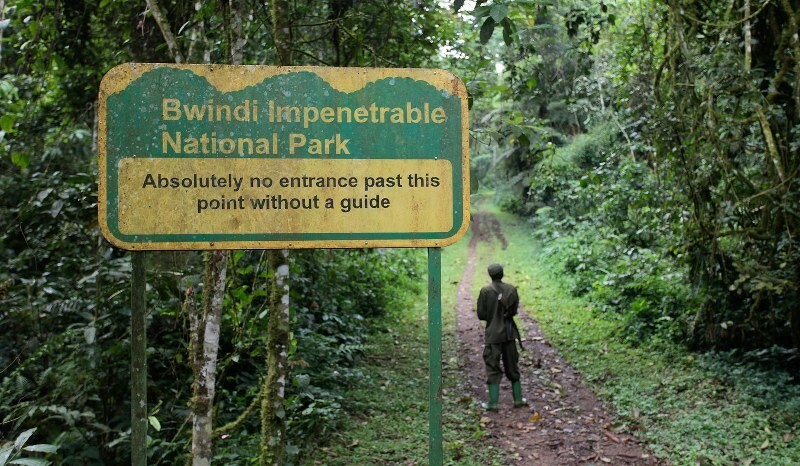 Day 8: By 8:00am, anticipate to be at Bwindi park for gorilla trekking at your allocated gorilla trekking sector. Day 9: After gorilla trekking, you are driven to lake Bunyonyi where you take a canoe ride to the punishment island. Day 10: On this last day of your trip, you are driven back to Entebbe international airport for departure. On arrival at Entebbe international airport, a knowledgeable Uganda safari driver guide will pick you up for a drive to a lodging facility in Kampala. With an introduction to Uganda and briefing on your safari during the drive, you arrive for check in, have a meal, refresh and relax from your flight. You spend the night at the hotel/lodge as you prepare for a drive to the countryside the next morning. From your accommodation facility in Kampala, your Uganda wildlife safari driver guide picks you up for the drive to Murchison Falls National Park. 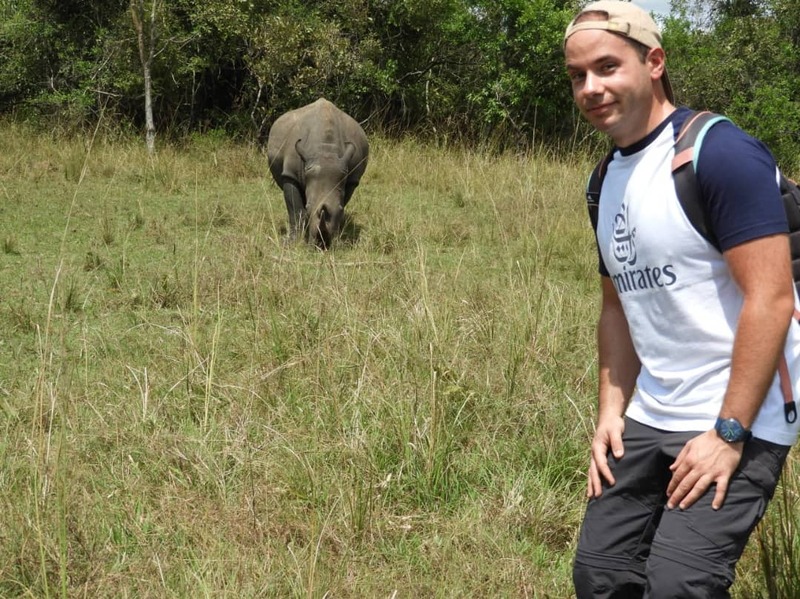 A branch off to Ziwa Rhino Sanctuary starts off your wildlife encounter as you go for Rhino tracking on foot for about 2 hours. After Rhino tracking you are driven for Lunch then continue with the drive to Murchison falls park. Arriving in the evening, you check into an accommodation in Murchison Falls national park where you relax as you prepare for a game drive and boat cruise the next day. A morning game drive starts the day at Murchison Falls park starting at 8:00am within the vast plains of the park. The elephants, lions, leopards and buffaloes alongside many more wild species make the common sightings of the morning. This amazing drive in the vast savannah plains of northern Uganda lasts 2-4 hours then after return to your lodge for lunch. 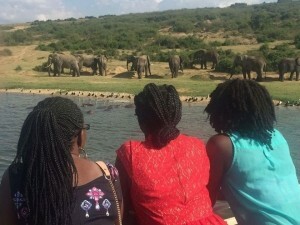 In the evening at 2:00pm, you go for a boat cruise to the bottom of the thunderous awe-inspiring Murchison falls where you look out for numerous schools of hippos, crocodiles and water birds at the bottom of the falls. From the bottom of the falls, you take a hike to the top of the magnificent Murchison falls for about 1hours where you find your driver guide waiting for you at the top. Late evening after an amazing experience on your wildlife safari in Uganda, you are driven back to your lodging facility for dinner and an overnight. After a relaxed breakfast on a wildlife safari in Uganda’s Murchison Falls national park, you are driven to Kibale forest national park. For about 7-8hours driving past the beautiful scenic Albertine rift valley landscape you arrive in the evening. On arrival in the evening, you check in, have dinner and relax at a prior booked accommodation in Kibale forest national park. 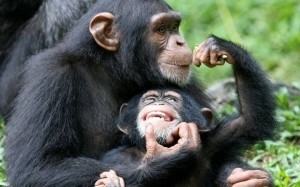 By dawn, you will be at Kibale forest park headquarters for chimpanzee trekking after having early morning breakfast. 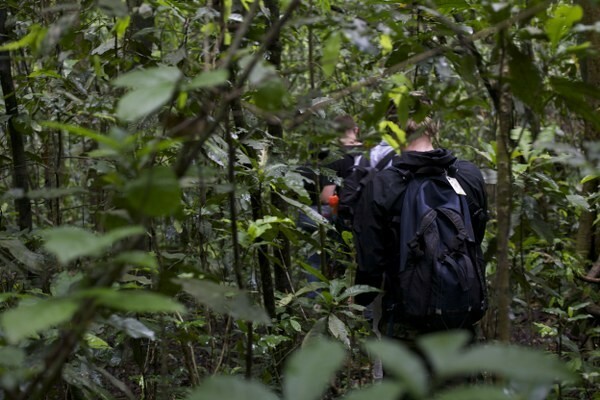 The chimpanzee trekking activity starts at 8:00am in kibale forest lasting 2-5 hours in the jungle though only 1 hour in the presence of the chimpanzees. Watching chimpanzees at play as they chunk fruits and interact is an amazing moment with a lot of memories. You return to your lodging facility for lunch and then transfer to Queen Elizabeth National Park in the evening arriving for check in at an accommodation in Queen Elizabeth National Park. From your lodging facility after early breakfast, you are driven to Queen Elizabeth park for a morning game drive. This less tiring activity offers you about 2-4hours of wildlife sightings including lions, zebras, waterbucks and many more. After lunch in the afternoon you will embark on a boat cruise along the 45km long Kazinga channel. 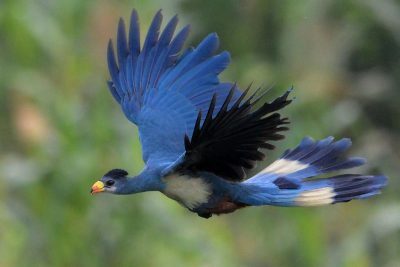 Here you will have the opportunity to view great numbers of wildlife like elephants monitor lizards, crocodiles, hippos, buffaloes and several bird species. On a return drive to your hotel/lodge you have an evening game drive towards the hotel/lodge. After breakfast, you are transferred to Bwindi impenetrable national park through the Ishasha sector popular for tree climbing lions for an en route game drive with possible sightings of the tree climbing lions, buffaloes, elephants, water bucks, bush bucks, Uganda Kobs and many more. You arrive in the evening for check in at an accommodation in Bwindi impenetrable national park. The moment for a mountain gorilla encounter is finally here, expect to wake up early, have breakfast and then transfer to Bwindi park headquarters for gorilla trekking. 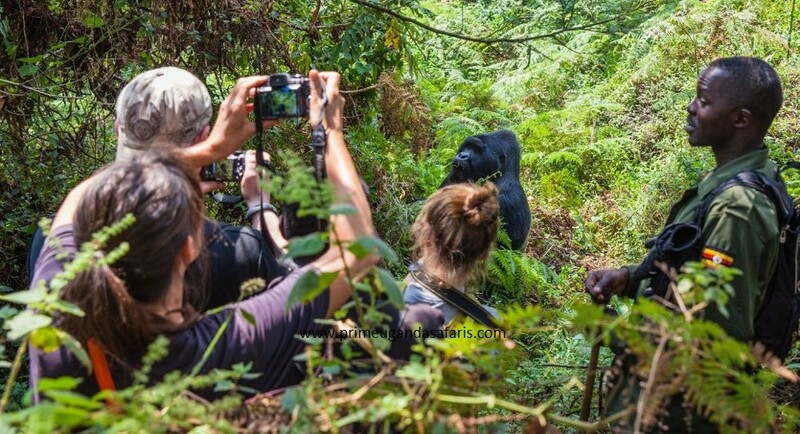 Before you get into the gorilla homeland, you have a briefing by the park rangers on Uganda gorilla trekking safari etiquette at 8:00am for about 30 minutes. Potters who can help you carry any luggage such as packed lunch, water and any other items such as cameras are available and in case one fails to take on the trek of the steep mountains these potters do the pushing as well and when you totally a stretcher can be hired at a fee. About 2-8 hours are spent in the jungle and only 1 out of them in the presence of these gentle giants. A Uganda gorilla trekking certificate is received at the end of the trek at the park headquarters where you find your driver guide waiting to transfer you to your lodging facility for an overnight stay. After breakfast-the last at the foothills of the gorilla home, you are drive to lake Bunyonyi which is the deepest lake in Africa. Arriving in the afternoon, you have lunch then take a canoe ride to the punishment island. This island is one of a kind in Africa with very touching stories that are attached to it. Along with a local guide on the boat you will take this refreshing cruise to the island that has only 1 tree surviving on it. After the canoe ride, you return to the shores of this bilharzia free lake where you relax before you spend the night at an accommodation in lake Bunyonyi. You have breakfast early morning, then embark on the drive back to Entebbe international airport for a departure flight. You will have lunch en route at Igongo Cultural Centre in Mbarara where you can have an optional visit to the cultural museum that has a variety of antiquities and books about cultures of the west. After lunch, you proceed with the drive to Entebbe with a possible stop at a craft shop along the way for crafts shopping. A wildlife safari to these 4 safari parks could offer nothing less but fun, refreshment and rare sightings. 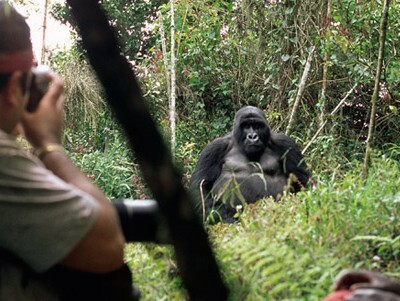 If you would love to have more wildlife encounters either in Uganda or East Africa always make the right choices. For Tanzania safaris, Serengeti national park is one of the best destinations, Volcanoes national park for a Rwanda safari and Amboseli national park for Kenya safaris. 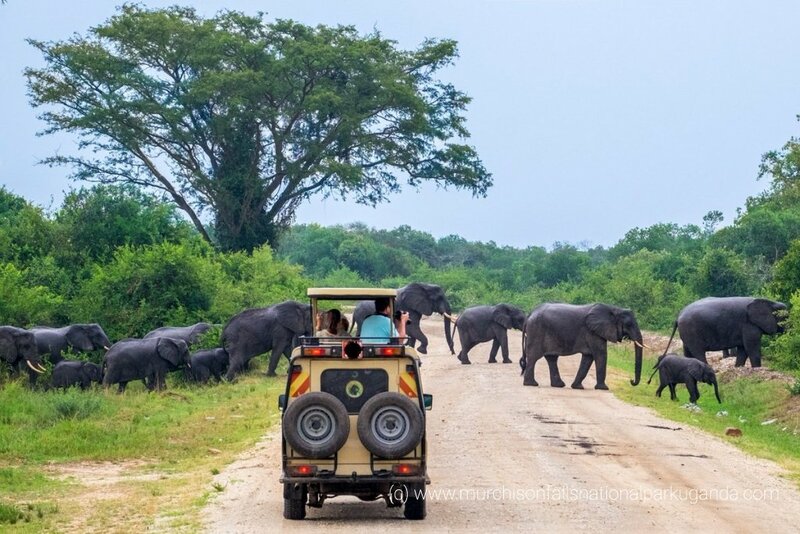 No matter the kind of safari you want to take in Uganda, always take advantage of our expertise and customize this safari to suit your interests.